The agricultural industry relies on scales as part and parcel of that enterprise, employing scales for everything from livestock to grain and feed commodities, and containers to crates. Scales are essential to the industry’s bottom line as well, where precision and accuracy guarantee standards of reliability as well as safety. 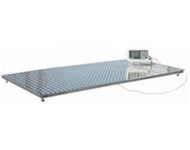 One scale basic to the agricultural industry, aside from the floor scale, is the platform scale, which can be customized to suit specific agricultural industry needs. A platform scale has a basic build but superior standards in design, materials and application can really distinguish the quality of a scale when it comes to selecting a scale that actually meets your needs. A checklist of qualities in construction, operation and cost facilitate choosing a great platform scale. Though outwardly simple in design, platform scales are actually quite sophisticated weighing instruments in practice. The design functions primarily as a two part system consisting of the weighing platform and the display. The most essential parts of the platform scale are the load cells, which are essential in determining the accuracy and repeatability of the scale. We have also developed optional features and specific modifications and capabilities to support your specific agricultural industry needs as well. The most basic quality of any industrial scale is its ability to produce repeated reading accuracy under any conditions. Quality construction and innovation in design determines accuracy. An industrial scale production company that displays a history of quality, technological advancement and cost effectiveness will save you time and make it worth your attention and investment. Consolidate your time and effort and invest in an Arlyn Scale. Our 30 year presence in the business has built our reputation as a leader in rugged, dependable and high precision industrial scales. We have outlasted most and surpassed the rest. Longevity is a certain sign of quality assurance and we offer the very best in quality materials as well as patented engineered technology at a reasonable cost. We design and fabricate all our subassemblies, resisting the trend to buy cheap and declining to buy foreign products or materials and rebrand. We develop our products locally, which keeps us cost effective. By eliminating the middleman and shipping factory direct to our customers, we ensure that you pay only for the product and never for the mark-up. This allows us to offer high quality products at the competitive prices. We ship fast from our warehouses, and specialize in developing custom scales to suit your exact requirements. Our formula is quality combined with high standard design and innovation that delivers the most accurate and rugged inventory available. The general build and design of a scale platform includes load cells, which are constructed to detect and weigh what is placed on the platform scale and register weight with repeatable accuracy. The best platforms must take into consideration all the challenges in real time loading. For example, livestock that will not stand still on a scale platform and large uneven bulky loads that are prone to frequent shock loading. Any platform scale based on even force pressure on the scale is going to fail. Arlyn Scales are industry ready in every way. An Arlyn Scale platform scale uses four load cells embedded and protectively machine pocketed in each corner of the frame to ensure an even balance and accurate readings whether the load is centered on the scale or not. Every Arlyn Scales load cell is constructed of a specialized stainless steel alloy built to eliminate reading inaccuracies and output signal shifts. The stainless steel construction is premier and durable in challenging environments and lasts longer, resulting in fewer replacement costs. One of the key advantages regarding Arlyn Scales load cells is that we manufacture them ourselves and have found a way to eliminate the summation board. The industry standard is to use a summation board and manually make adjustments until the output signals from all the load cells are identical. Instead, we manufacture load cells in bulk and measure the output signal of each load cell, organizing them in groups of four based on their identical outputs. This is a great time saver, and eliminating the summation board also eliminates one of the main causes of scale failure. Connectors and adjustment knobs on the summation board are prone to environmental damages and are one of the least reliable scale components. Summation board failure is a common occurrence that translates to downtime, halts in production and dealer repair. Arlyn Scales are thus more accurate, more reliable and better built for productivity in every way. Our platform scales, as a standard, come with aluminum construction, which is designed to protect the load cells and support heavy loads. However, we also offer these scales with stainless steel construction for superior corrosion resistance. Our optional three part epoxy with mica particles also provides extra protection against corrosion and abrasion resistance, unlike other companies who use cheap paint that does not protect the scale from rust once it’s scratched off. Our epoxy inhibits rust from forming in any scratches while preventing its spread to other parts of the scale, increasing the longevity of the scale. Ethernet, which enables a scale to be monitored and controlled using a local network either as a plug in or wireless connection (Remote Indicator Software). Weights can be recorded, sorted, grouped, and analyzed remotely from a work station PC. USB interface with our free USB Remote Software interfacing with Windows Excel and databases and any windows application on a PC. Datalogging enables the use of a flash drive for weight data storage and retrieval, which permits mobile work and work in the field. Set Point allows the user to enter up to eight weight values into the scale, enabling automatic filling and PLC functions. The set point automatically monitors designated weight value, sending a signal to either turn off or turn on equipment. This includes multiple differing target weights. If you’re a business in the agricultural industry and you’re having difficulty selecting which scale would meet your needs, we’d love to help you! Just give us a call at (800) 645-4301 or fill out our online form to discuss your options. If you’d like to browse our selection of platform scales, please visit our platform scales page.